Having a great writer isn’t enough when you’re thinking of a blogging strategy for your business. Before you even decide what kind of blog you’re going to produce, you need to decide who you want to read and understand your blog. Here’s a step-by-step guide on how you can find the audience you should be targeting with your content (without conducting a survey). Are the people who make it to your business’s website older or younger? Is what you sell meant for older people or younger? While this isn’t a big deciding factor on who you should be focusing on, it is a great starting point to figure if you should be writing for someone who is young, old, or somewhere in between. What is the percentage of male to female visitors on your website? Does your market consist of more males or females? Address the specific needs of your target audience. Just because you’re seeing more females on your site doesn’t mean you should exclusively target women with your marketing. Use a variety of content and images to tailor to your whole audience, but keep in mind who is more likely to make it to your site. You shouldn’t exclude anyone, but let your data be your guide in choosing imagery and writing style when it comes to targeting people. For example, imagine you find that male visitors on your site range from ages 25 to 35. If you’re picking an image of a male model, pick a model that falls under that age range. If your site also has a relatively high percentage of female visitors, make sure there’s content that caters to their needs, too. Affinity Category. These are categories based on the lifestyles of people who have visited your site. In-Market Segment. The in-market segment is based on the markets people are in. For example, some users might be looking for employment, while others may be interested in education. If you’re running a beauty school, knowing how many people are in the market for education is important. Note: This does not mean you should pick a topic unrelated to your business just because your audience is interested in it. Remember, content is king in context. Where is your main audience compared to who you sell to? Do you work with people throughout the United States or do you stick with a small service area? If you want to boost site traffic for a specific area, write a blog that focuses on your audience in that area. If you’re a company that serves a national audience, that’s great, but keep in mind that each state is different and has different needs that can be met with a well-written blog. Are your users more likely to check your website on desktop or mobile? While this isn’t the most important aspect of your audience, it can help you format your blog for the right audience. If your website visitors are more likely to use their phones to access your blog, make it mobile-friendly. However, don’t sacrifice a good user experience on desktop to make the mobile experience better. Don’t use each piece of data separately. Instead, create a general idea of multiple types of people who would be your target audience. The goal of a business is to get as many sales as possible, right? That’s why it’s so important to make sure each part of your audience is represented. You don’t want to exclude the part of your audience who buys the most of your product or service because you saw more visitors of a different demographic. If you want to increase the traffic of a certain demographic, then you can create a campaign that targets that demographic, but you shouldn’t focus your entire content marketing strategy on only one segment of your current audience. Believe it or not, these facts are a great resource for blog topics. Did you know people in Salt Lake City care about their looks? Pretend your business was in the beauty industry targeting people in Salt Lake City. Tips on how to apply makeup to look great will probably be something your audience would want to read. 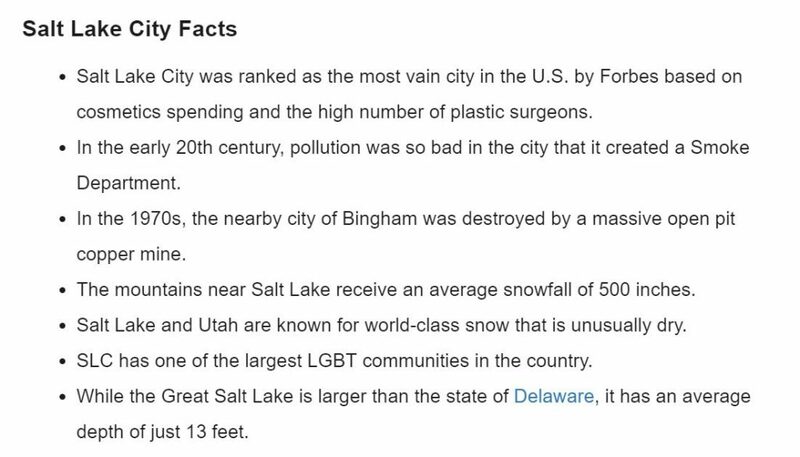 If you were selling air purifiers, knowing that Salt Lake City has terrible pollution is definitely going to be a great selling point. Your current customers can give you a clue as to what goes well with your business and what doesn’t. Look at reviews to see what services people were happy with and even what areas your content could improve on to answer questions people might have about your business. Words like these are pain points that have been addressed by the company. That means blog topics around those keywords may be helpful to other people in your audience. Are there a number of threads based on the same question? Does your audience use jargon? What do people complain about in the industry? What are the interests of the people in your industry? Why would they be interested in your product? What questions do they have about your company? What problems do they have that your company could solve? What are pain points they have that your company addresses? What are pain points they have that your company doesn’t address? How would they get to your website? Build two or three personas based on the research you’ve done on who your target audience is. Choose personas at different parts of the buyer’s journey to create a broader variety of content. The key to targeting the right audience is to create more than one persona. Every person is different, and not every piece of content is going to work with every person in your audience. By creating more than one, you have a better chance of hitting a broader audience by creating different types of content that work with different personas. This is better than focusing on the same person every time. I’ve Created My Personas, Now What? It’s time to pick a persona and determine the purpose of the piece. Different types of blogs resonate with different people, so choose the kind of blog that you think the persona you chose would want to read. Every blog isn’t going to attract your entire audience every time, and that’s okay! Is your audience more highly-educated or would a simplistic approach resonate better? While you shouldn’t sacrifice the voice of your brand to connect with your audience, your brand should be created with your audience in mind. Depending on what your company offers, it’s important to pick images that your audience connects with. Remember the demographics you looked at, and choose images that match who you’re talking to. Especially if you’re marketing as post-secondary education, choose images that represent what your students look like. This is important because your audience is more likely to connect with your brand if you are showing who you’re targeting that they are in fact who you are looking for. 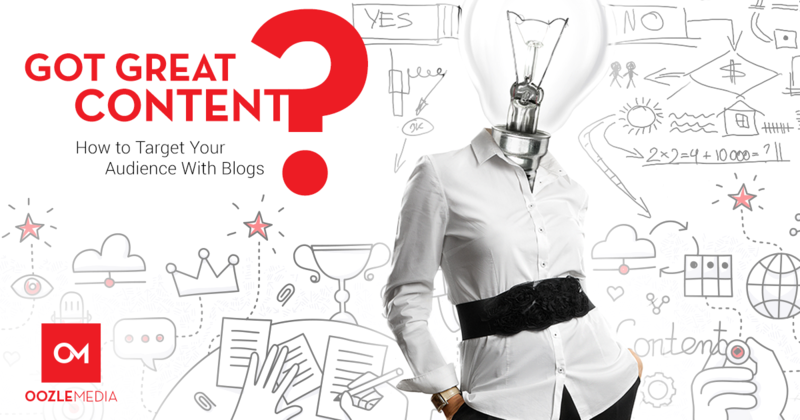 Is your audience more likely to skim or are they looking for information-heavy blogs? Add headers, images, and other visual elements if your persona is more likely to skim. If your audience consists of heavy readers, write enough content to keep them interested. If your blogs aren’t getting the traffic you’re looking for, it could be because they aren’t written for the right people. Blogs should be helpful, not focusing on the sale. By answering the questions and fixing the problems your audience has, you are showing that your brand is who your audience is looking for. If you want more tips on blogging for your business, check out these 10 tips to writing a great blog or how to create content clusters to draw your audience in. If you’re looking to revamp your blogging strategy, contact us today to learn more about how to build the right content marketing strategy for your business.